Automation/Timer/Scheduler. Start an application/alarm at every x minutes. Free. ...... 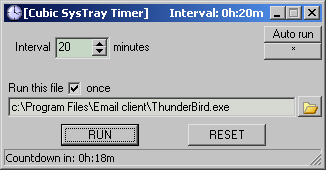 Chose an interval (between 1 minute and infinite), choose the file to be run and that's all. * Choose a loud sound file (like an mp3 Plck song) and instruct the Program to run it after one hour. Now go to sleep. You are really tired. The Program will wake you gently. How does SysTray Timer work? Qweas is providing links to SysTray Timer 1.7.1 as a courtesy, and makes no representations regarding SysTray Timer or any other applications or any information related thereto. Any questions, complaints or claims regarding this application SysTray Timer 1.7.1 must be directed to the appropriate software vendor. You may click the publisher link of SysTray Timer on the top of this page to get more details about the vendor.